Small Businesses 'Square' Away Client Bill Pay Small business owners no longer have to purchase scanning devices or pay processing fees to be able to accept credit cards. Square, a device and phone application developed by Twitter co-founder Jack Dorsey, lets them collect on-the-spot payments with a cell phone. Many small businesses don't accept credit cards because of scanning device costs and fees associated with processing charges. Smart phones are the fastest-growing segment of the mobile phone market, which means mobile payments are growing as well. Now, some new products are helping even the smallest of businesses be able to take on-the-spot credit card payments. Jeff Barber and Kurt Schuyer own HybridLawns, an environmentally friendly landscaping company. They started their business two years ago when they were laid off from their respective construction jobs. Since then they've been mowing lawns, pruning hedges and scooping up leaves for about 20 clients. But, Barber says, like a lot of small businesses, they've had trouble collecting regular payments. "We were trying to go paperless because we're eco-friendly, but for the most part we just e-mailed people. You know, 'Here's your bill ... pay us your bill, send us your check,' and it would come snail mail," he says. "Sometimes they kind of dragged their heels a little bit." They say getting paid can sometimes take weeks, which is why they got the Square app and device -- a credit card reader about the size of a postage stamp that plugs into the headphone jack of an iPhone, Android phone or iPad. It also makes it easier for customers. "It sits there forever and I forget about it, so this makes it great because it's done as soon as they come by with the bill," says Jackie Lacomb, a HybridLawns customer. "It's here. I'm finished." Jack Dorsey, one of the founders of Square and a co-founder of Twitter, says he was thinking about on-the-go, small or micro-business owners like Schuyer and Barber when he came up with the idea for Square. "We dramatically simplified the way people can start accepting payments so that you can accept them from anywhere," Dorsey says. WaveSecure — A McAfee product that secures mobile phones in case of a theft or loss. This app protects data, ensures privacy and even increases the possibility of recovering the lost phone. Bump — A quick and easy way to connect two phones and share information, whether it's a phone number, e-mail address or calendar event. Share information with employees and clients with one bump. Available for iPhone and Android phones. Seesmic — For business owners hoping to increase their social presence online, Seesmic allows users to manage multiple Twitter accounts at once by posting tweets, sharing photos and videos, and even updating your location with the help of maps. Available for iPhone, Android phones, BlackBerry and Windows phones. DataViz Documents to Go — This phone app lets users take advantage of Microsoft Office and Adobe products while on the go. Users can even synchronize their desktop computers and phones by transferring files with a USB. UPS Mobile — Users can track packages, calculate time and costs of deliveries, and find UPS shipping locations. Available for iPhone, Android phones and BlackBerry. Square opened its doors to the public in October. The device and the software are free. The company takes a flat 2.75 percent of each transaction, plus 15 cents, which is cheaper than fees charged by most other credit card payment systems. "[With other companies] you have to pay off a bunch of these setup fees and monthly minimums and other fees that look a little bit odd," Dorsey says. "All you have to do with Square is download it, sign up, and we give you a free reader and you can start accepting card payments." 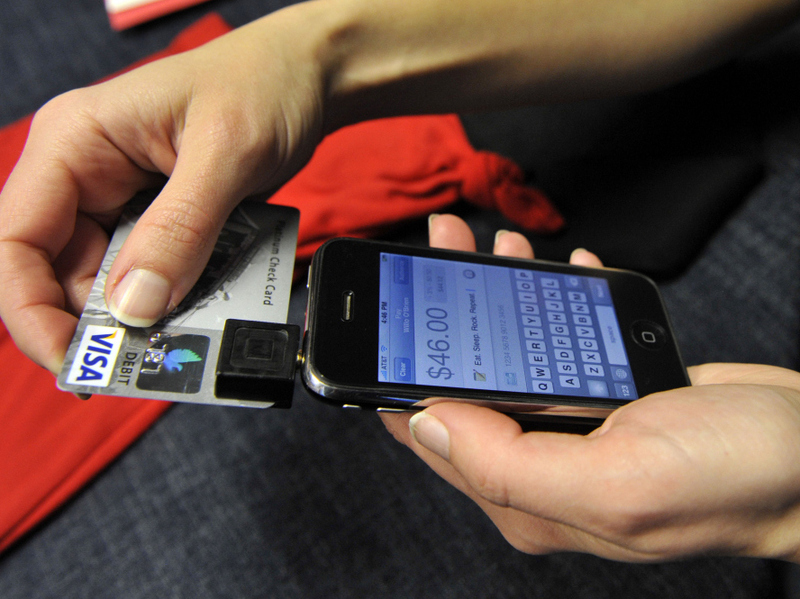 Square is now processing millions of dollars in mobile transactions every week. More than 45 million people in the U.S. have a smart phone, and as money-exchanging portals, they're a fairly untapped market. Right now there are only a few products competing in Square's space: Intuit -- another credit card swiping device made just for the iPhone -- a handful of banks that let customers deposit checks by taking pictures of them, and Chase, which allows person-to-person deposits via e-mail. All of this virtual moving of money has people worried about fraud. John Hering, of Lookout Mobile Security, says that's why companies like Square have built in stringent security measures from the start. "They're using very strong encryption and a number of the best industry practices," he says. "Now, it's going to be very important that anyone adopting a mobile payment technology makes sure that they're taking steps to keep their mobile device itself safe." In other words, treat your phone like your wallet: Don't leave it lying on a park bench. Hering says rather than fearing the future, think of it as extreme convenience with a little commonsense security. "When we look at mobile payments in general, I think that it's really the future in terms of payments," he says.